Since 1592, La Pouyade was exclusively reserved for members and privileged friends of the Bouyer-Dubosquet family. Only very recently has the 14th generation decided to make this same exceptional cognac available for larger connoisseur and privileged clientele. Only one quality exists. La Pouyade is a Grande Champagne Cognac Premier Cru, where the grape used in the elaboration, the Folle Blanche, is planted and where the family's own vineyards are located. 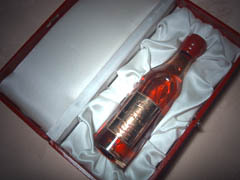 The gift box contains a 5cl mini bottle of La Pouyade, a perfect replicate of the traditional red wax sealed XVII th century style hand-blown big bottle with a silver-pewter label.